7.57 points at 14 votes (rank 179). The aim of this round based fantasy strategy game is the victory in the "War of the Solstice": the averting of the invasion of the Land of Midnight. The computer takes over the lead of the invasion troops. The Land of Midnight which is suffering from an ice age for thousands of years, faces a deadly threat: Doomdark, the ruler over the northern countries has awoken anew from his hibernation and has gathered a huge army in deepest winter driven by the endless might of his Ice Crown. Only a handful of Lords around Luxor the Moonprince and his son Morkin has still the courage to organize resistance, but the time is running out on them while Doomdark’s hordes flood the Land of Midnight. INVASION!!! Doomdark's troops befall the land. For this, the player needs to find all the military leaders and their armies that are scattered around the land and recruit them. Then, as soon as Doomdark’s attack is fended off, he can try to conquer Ushgarak, the hostile fort, himself. This version is the more time consuming of both and needs much micro management, as you have to fight at several front lines at the same time. As the movements of Doomdark’s troops vary from game to game, there are several concepts about how to successfully campaign. The campaign can be seen as failed, when the capital city of the Land of Midnight was run over by Doomdark’s troops. Alternatively you can try to destroy the source of Doomdark’s power, the Ice Crown. If you make this, you will gain instant victory independent of the current military situation. This version is significantly faster but can also find an abrupt ending, which is when Morkin dies. After that there is only the campaign left to win the game. It is up to the player to choose which way he wants to go. It is possible to take one approach or both at the same time and respectively change the approach if one of the two possibilities for the victory has become futile. 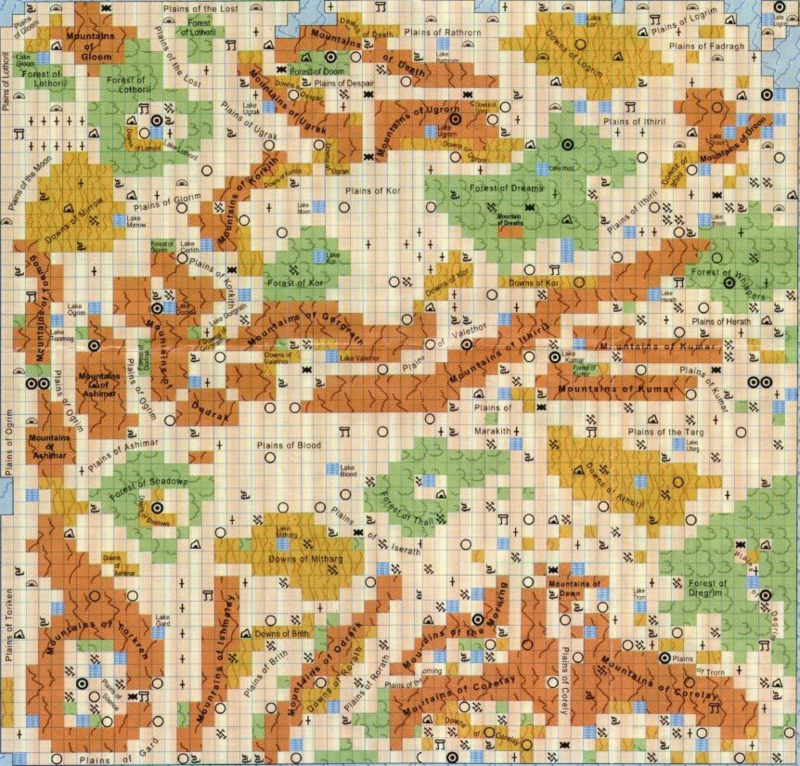 At the start of the game, the player has only four of the altogether 32 characters and no armies under his command. Luxor looks at his companions Morkin, Rothron and Corleth. The military leaders in the Land of Midnight are parted into three different peoples: The Free, The Fey and The Targ. Usually, a Lord can only recruit Lords of his own people. Additionally there are single characters without armies. The Lords are scattered around the whole country and some are at the beginning of the war threatingly exposed directly to Doomdark’s deployment zone. If these Lords are not instantly alerted and retreated, they will get rolled over during the night..
Wulfs, Skulkrin (the LOM equivalent to Goblins), ice trolls and dragons block important routes and pose a deadly threat for lonely characters. Dragons block the path through these mountains. is the supreme commander in the Land of Midnight. He carries the Moonring, which immunizes him against Doomdark’s magic. Luxor can recruit all "Lords of the Free" and the less mighty "Lords of the Fey": He himself can lead troops of the "Free". is Luxor's son and also immune against the "Ice Fear". Morkin is the only character that can steal Doomdark’s Ice Crown from its depository, the Tower of Doom in the outmost north on the map. Morkin can only recruit "Lords of the Fey" but not lead any own troops. He is in constant danger of being found and killed by Doomdark’s troops and therefore he needs protection from the other Lords and its armies. is a hero of the Fey people and can recruit both their Lords and "Lords of The Free". The can lead an own army of Fey soldiers. is a magician that can recruit ALL characters in the game, but not lead any troops. He is a notably good fighter that can defeat lost and decimated armies of Doomdark on his own, especially when he is in one of the many towers of the land. Doomdark starts with 128 armies with each 1000 or 1200 fighters or riders that attack the Land of Midnight at given targets approaching from the north. These targets can be specific players or military leaders and their armies, so e.g. there are several thousand troops assigned to chase Luxor the Moonprince. Doomdark’s armies attack the player's armies during the night, if they have intervisibility and their movement suffices. They cannot see single characters, but during their moving around they can "randomly" stumble across them and most of the time this ends deadly. Additionally, Doomdark possesses the "Ice Fear", a spell that has a demoralising effect that radiates from his Ice Crown and which gets stronger, the more of the Land of Midnight his troops take possession of. The Ice Fear can under certain circumstances get so strong that the whole armies get quasi horse de combat. Doomdark’s aim is to conquer Xajorkith, the player's main citadel in the uttermost south of the map and kill Morkin. Doomdark has also won, if both Luxor and Morkin were killed. So as long as Morkin lives, the game goes on. The map of the Land of Midnight comprises an area of about 4000 "fields", whereby each field shows a specific characteristic as e.g. woods, mountains or hilly landscapes. The happening is only shown from the first-person perspective of the characters that the player controls. In the game itself there is no top view of the map, which aggravates the orientation. By pressing the number keys one to eight you can choose a viewing direction (north, northeast, east, etc.) and by pressing the space key the character including all troops that it commands is moved into the chosen direction. Lords of Midnight is played in moves (1 move corresponds to one day), whereby the human player at first does all the moves for all his characters, whereupon it is Doomdark's, the computer player's move. Each character has a certain amount of moving points per day. Character's movements through woods and mountains cost more points than over open steppe. The factor of whether the character is on horse or on foot also adds to this. It can well happen that a character loses his horse during a fight, which limits its movement radius drastically. If all movement points of a character are used up, the night falls on him and his troops. He can then only move anew after Doomdark's move.... if he survives the night. Night breaks...Lord Shimeril ends his move in the Forest of Thrall. The area is created with the so-called "Landscaping"-technique, i.e. that higher objects as towers, fortresses or mountains can already be recognized from a greater distance. Looking on Lord Blood's fortress. In the background the enemy approaches. It can also happen that lower objects or area is covered, e.g. a village by a mountain. Also armies can hide in woods or mountains, which often leads to unpleasant surprises. Therefore it is very important to first get oriented well before you start marching on and maybe send out other characters first. At the left a fortress looms behind the forest, at the right a mountain blocks the view to the area behind it. One cannot see if there are any hostile armies luring in the forest. Next to the "normal" area, there are also monoliths, barrows, ruins and dungeons which have to be searched and which can cause a great number of effects. Villages and fortresses offer a safehouse for exhausted armies and towers even give helpful hints, if you use the command "seek" on the same field. 0 end move. Doomdark then calculates his move. After "do you seek dawn?" answer with "y" to continue. Tower of the Moon: it is in the southwest of the map in the middle of the Forest of Shadows. Luxor and his companions start from here. Citadel of Xajorkith: this is at the southern border of the map on the Plains of Corelay. To conquer it is one of Doomdark’s conditions for a victory. Citadel of Ushgarak: it is high up in the north, on the Plains of Despair framed by three mountains. If it is conquered, then Doomdark is defeated. Tower of Doom: it is north of Ushgarak. This is where Doomdark's Ice Crown lies. If Morkin steals and destroys it, Doomdark is defeated. Morkin is the only character that can steal the Ice Crown from the Tower of Doom in the uttermost north of the map. Farflame the Dragonlord, Fawkrin the Skulkrin or Lorgrim the Wise can then destroy the crown, if they are on the same field as Morkin. As an alternative, Morkin can also throw the crown into the Lake Mirrow. Doomdark's superiority in numbers is simply back-breaking. The player can hope to gain a local superiority and with this tactical victories for a short time, especially in the early phases of the game. Doomdark's reaction to such pinpricks is mostly crushing, as overnight especially in difficult terrain several thousand fighters can move up without any problems. Doomdark's troops arrive at the main fortress of the Land of Midnight at approx. the 15th day. They have to be stopped here. The sword Wolfslayer automatically kills wolfs, equally does the sword Dragonslayer automatically kill dragons. Mostly they can be found in fortresses and citadels and are enormously useful for single characters. A character that leads troops automatically kills monsters. So such characters can smooth the way for single characters. Troops and characters of the Fey move faster through woods than other troops and get a bonus there during close combat. Troops that constantly fight or march will exhaust fast and thus lose fighting power. They have to be rested during breaks or by accommodation in villages, fortresses or citadels or else their fighting power will sink fast. The closer you get to the Ice Crown or the more land Doomdark acquires, the stronger will the "Ice Fear" and with this Doomdark's fighting power get. Troops in fortresses and citadels get a significant bonus on their fighting power. Characters on foot can tame wild horses by "Seek". Lords that are "utterly terrified" will refuse to fight against Doomdark. Lords that are on the same field as Morkin get additional points subtracted by the effect of Doomdark's "Ice Fear". Monoliths often contain a "Cup of Dreams" which refills the movement points of a character. Ponds often carry the "Waters of life" which maximise a character's energy and the one of his troops. Ruins, dungeons or stone circles often contain negative events as the "Hand of Dark" or the "Shadows of Death". Single characters can elude Doomdark’s grasp with the command "hide". With one exception: Morkin! As soon as a single character recruits troops, he will be visible for Doomdark’s armies and risks being attacked and chased. Morkin steals the Ice Crown from the Tower of Doom which is then destroyed by Farflame the Dragonlord. Victory to the Free! Robotron2084: "Although the C64 version of this genre hyper classic - which was originally written for the ZX Spectrum - does not offer any graphical let alone sound technical improvements, it is still belongs absolutely to the ′set books′ of an experienced hobby strategist. The graphics are to put it mildly functional but still stylish. The AI, if you want to call it that at all, is designed simply but effectively and can still ′surprise′ you after more than two decades. But the most important thing is the atmosphere, which takes possession of the player similar to Doomdark's ′Icefear′, slowly but surely during the hours that this ′epic war game′ can last. It already seems threatening when the dark armies move inexorably towards you at the horizon, while you have got your hands full with fighting the war at several fronts at the same time. There is not for nothing still a huge active fan base for a strategy game from 1985, which by now plays Midnight multiplayer campaigns online with exactly the same graphics and the same basic mechanism as thought out by Mike Singleton at that time. This should speak volumes. Short: I want to warmly recommend Lords of Midnight to all fantasy strategists for an ice cold winter Sunday afternoon. 10 out of 10 points!" A strategy game with the title "Sorcerer Lord", rather obviously inspired by Lords of Midnight, was released by PSS for the C64 in 1988. The plot and the game mechanisms were almost hair-raisingly boldly copied. However, the background story of Lords of Midnight is oversignificantly based on "The Lord of the Rings". The story was enclosed to the game in the shape of an interestingly design novel. The Publisher offered to publish the story in a novel to the first one who solved the game in the ZX version. 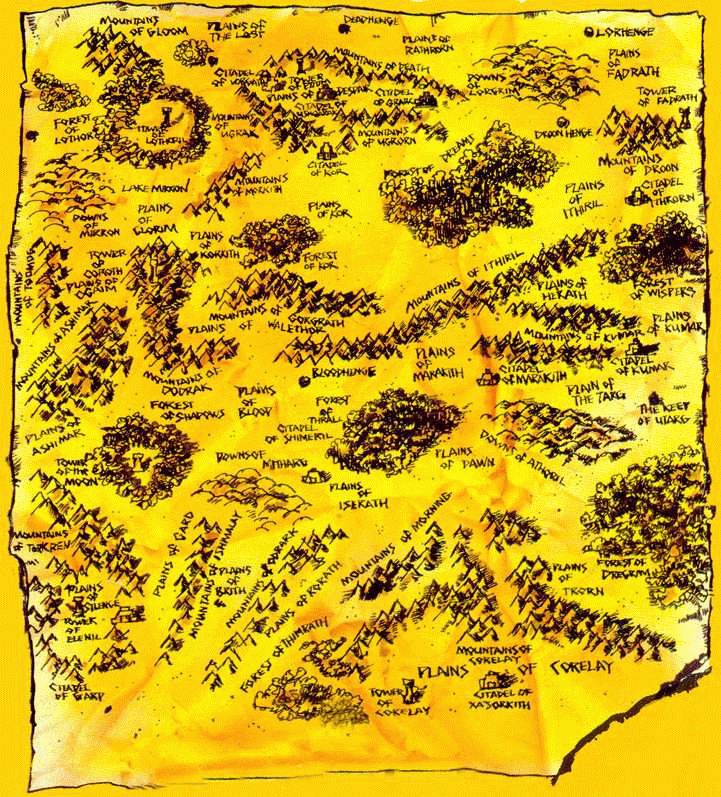 Many players sent in numerous papers from thermal printers to Beyond Software in the hope that their campaign would find its way into the novel. However, no publishing house could be found, as the project was not seen to be successful. The game was awarded the British Golden Joystick Award in 1984 in the Category Best Strategy Game of the Year. The award refers to the ZX version, which was released a year earlier.